Description: This species is probably native to India globally distributed in the Indian subcontinent. Within India, it is commonly found throughout the greater part, and is often cultivated. 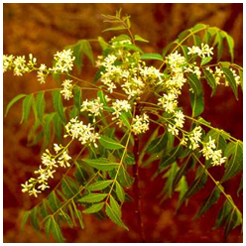 How to Grow: Neem grows well on flat ground with high sub-soil water level and good drainage. It tolerates temperature ranging from 0 C to 40 C, altitudal variation from sea level to 1500 m and an extremely low annual rainfall down to 130 mm. It also possess certain amount of drought hardiness. Care regime: Neem being a hardy and drought tolerant plant needs little after care.They are usually watered once in a while during summer months for the first 5 to 6 years.